The MenuPopupView class is a layer used to show JavaFX Menu instances within the user interface that will scroll out from the edge of the screen. 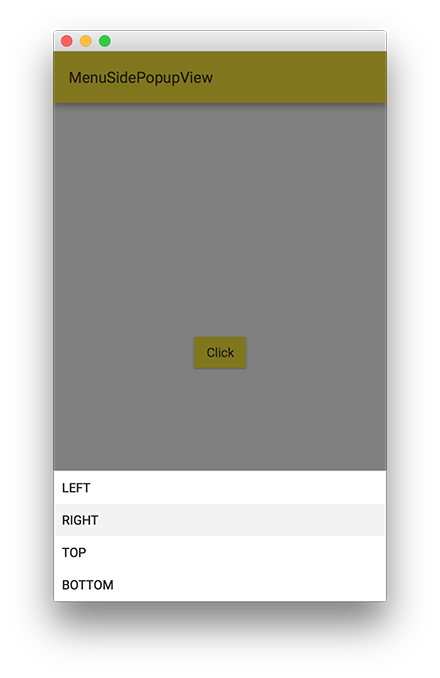 The following example shows a MenuSidePopupView when the user presses a button. Creates a new MenuSidePopupView instance that will be displayed from the bottom edge of the screen, containing the contents of the given Menu. Creates a new MenuSidePopupView instance that will be displayed from the side of the screen, as specified by the side parameter. If this layer is showing, calling this method will hide it. Creates a new MenuSidePopupView instance that will be displayed from the side of the screen, as specified by the side parameter. The popup will contain the contents of the given Menu. side - The side of the screen to show the menu from. If this layer is showing, calling this method will hide it. If a hide transition is present, it is played before hiding the Layer. Care should be taken to call this only once LifecycleEvent.SHOWN has been fired. LifecycleEvent.HIDING is fired as soon as the method is called. LifecycleEvent.HIDDEN is fired after the hide transition has finished. No-op if Layer.showingProperty() is false.